Books have always been a massive part of my life, from when I was tiny and first read Harry Potter. 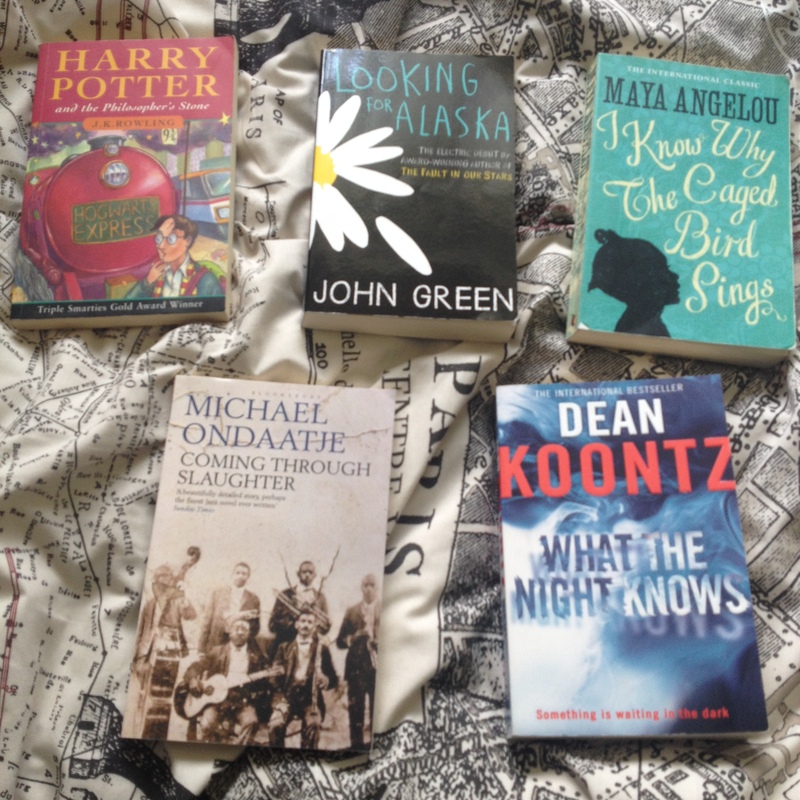 So I thought it would only be fitting to start of my blog with my top five books of all time. And after a LOT of thinking, I’ve finally managed to narrow it down. What the Night Knows – Dean Koontz. I’ve recently become a little obsessed with Koontz, buying every book by him every time I’m in a second-hand shop (which are absolutely brilliant for buying books by him by the way, there’s always tonnes) and loving every single one. Although What the Night Knows wasn’t the first book I read by him (Innocence, which is also glorious, if anyone is interested), it was the book that started the love. It’s one of the scariest I’ve read by him, but the characters are complex and engaging all the way through. Although if I’m honest, all of his books are brilliant. I Know Why the Caged Bird Sings – Maya Angelou. I first read this book for sixth form, and just fell in love with the way Angelou writes. I’m not usually a huge fan of autobiographies, but her life was so interesting, and the way she writes so captivating that I can’t not name this in my top five. Despite there being some very grim themes in the book, which follows her childhood, she always manages to maintain a light tone, often making me laugh out loud with her anecdotes. I would also thoroughly recommend her poetry! Looking for Alaska – John Green. I’m still not entirely sure why I put this on my list, but when I was looking through my books trying to decide, I just picked it up and remembered how much I love it. It’s beautifully written and I love the whole concept of last words that runs the whole way through. The characters are complex, but relatable and I’ve read it countless times, and have always enjoyed it. Harry Potter and the Philosophers Stone – J.K.Rowling. I first read this book when I was 5, and since then probably a hundred times (and that’s not even an exaggeration.) You could definitely say I’m a little obsessed with Harry Potter, being very excited when a round on it turned up in the charity quiz I went to last night. It’s the sort of book that I feel like I don’t even need to explain why I love it, and will always remind me of my childhood (although I get the same – possibly even more – enjoyment out of reading it as I did when I read it for the very first time.) Although I will always laugh at the fact that my Dad wouldn’t let me watch the final scene of the film when I was little because he thought it was too scary – despite letting me read it and watch the rest of the film. Well that is what I narrowed down to my top five books, but even as I’ve been writing I’ve been thinking of books I’ve missed (primarily The Bell Jar by Sylvia Plath.) But regardless, it would be really interesting to hear what other people’s favourite books are, so if you’re interested, leave a comment below! That’s a nice and diverse selection. 🙂 I always think it’s hard to list a handful of favourite books because I have so many. XD Right now I’d probably say Goodbye to Berlin (Christopher Isherwood), Oryx and Crake (Margaret Atwood), The Ocean at the End of the Lane (Neil Gaiman), The Passion (Jeanette Winterson) and The Charioteer (Mary Renault). But it’s subject to change. Haha same with me, even when I was writing it I was thinking of other favourites! I love the ocean at the end of the lane!